A fine movie with some cool music and thrills, that delivers in some ways, but feels pretty forced in others. Signs is a good movie that feels a little too campy at times, but overall has some pretty cool thrills and story elements. the idea here is that there is a small family living on a farm that experiences supernatural events. this is the start of an alien intrusion and as the movie goes on, one clue leads to another. each one is handled very carefully so as not to show us too much, and instead to keep us wondering and guessing. most of this works. the first half of the movie is more humorous and the second half is more suspenseful, and this balance makes the movie feel fun. the problems come when the characters start preaching about fate and things like that. some other moments that feel forced come from the director trying to get shots that seem more clever than practical or realistic. still, the movie doesn’t waste any time and has a pretty original plot, told with nice twists and turns. it’s definitely a good movie that just needed to be tightened up a bit. Signs is one of those movies that really strives to be a thriller the way alfered hitchcock would have told it. granted the movie is about aliens, which is a topic that hitchcock never even came near, but the way suspense, surprises and storytelling are all unfold delicately here is very much the same way hitch used to do it. the same can be said of the music, which is intentionally over the top and eery, becoming a major factor in illiciting reactions from the audience. the storyline of this movie centers around a family living on a farm out in rural pennsylvania. there’s graham, the father (Mel Gibson), his brother, merill (joaquin phoenix), and his two children, morgan and bo. graham’s wife died six months ago in a horrible car accident where she was run over while out for a walk. his brother moved in with the family shortly afterwards. we learn all about this through flashbacks later on. at the start of the film, it’s just the four of them on the farm at night. 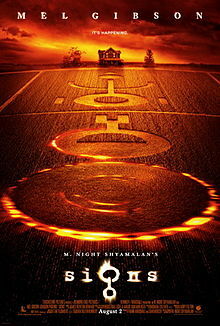 the movie opens with the discovery of huge crop circles appearing in graham’s corn fields. there is a child’s scream coming from outside that wakes both graham and merill up. each of them comes running out of his house (Merill lives in a side house), and they both go running towards the corn fields. when they get there, the kids are outside and are fine. morgan, the boy, grabs his father’s chin and turns it in the direction of the crop circles. just this motion, of leading the audience to the discovery at the same time that the character sees it, is very meticulous and intentional. it’s not bad, but it does feel a little obvious. graham calls the police, and a female officer arrives on the scene to go over the situation with him. they are puzzled by how this could have been done to his crops since a human can’t really bend a stalk of corn without breaking it. the movie makes all of this pretty clear. still, graham believes it was done by human hands, thinking it was a man named lionel pritchard and his boys, a bunch of local pranksters. that night he and merill hear sounds as if someone is on their roof. they go running outside, trying to scare the person, but can’t catch whoever it is. the scene is played for comedy more than it is for thrills, and it only partly works. the movie might have been better served if the film chose one tone and went with it, but instead it very often tows the line between these two genres. other unusual things start happening too. the family dog becomes strangely sick, behaving in ways that are out of the ordinary. they learn from the cop that other dogs have been experiencing the same thing as if something is terrifying them. then one day the dog attacks bo and her brother, morgan, has to kill it. aside from that, morgan picks up a weird sound on the baby monitor and climbs up on a car to get a better transmission. this scene is clearly trying to play with levels, having each character at a different height. maybe it’s the camera angles that make it so obvious, but it’s a little unnecessary. especially when all four characters get up on the car and each one is holding onto the next, like a giant chain game. there’s just no reason for bo and graham to get on the car after morgan and merrill are already on it. sure, director shamalan gets an interesting shot out of it, but the moment also feels very forced and unrealistic. it isn’t long before other crop circles, similar to the ones on graham’s farm start appearing all over the world. after that, it becomes lights in the sky, which the family sees on news reports. they go into town to get supplies and split up, with each of the characters going somewhere else. graham goes to the pharmacy to get medicine, the kids go to a local bookstore, and merrill goes to find out about joining the army. this sequence feels out of place. especially with each of the characters going to such random stores. merill’s army scene, for example, exists just so they can tell us some of his backstory about baseball. the point of the sequence is to have the characters get away from the house, and so the movie can kill a little time without it feeling like too much of the same thing. the funny thing is, if the whole movie stayed in or around the house, it might have actually worked better. at one point graham goes to visit the guy who ran over his wife, and at another point we see the flashback to how his wife died. these scenes are all fine, but they take us out of the claustrophobia that we should be feeling, as if we are really there with the characters. there’s a good chance that the movie would have benefited from staying in the house the entire time. now, they did consider this when making the film, and decided not to limit themselves by restricting it’s moves to the house, but it would have seemed a whole lot scarier if there was never a sense of escape and other places they could go. it also would have been a lot cooler, in a more creative and experimental kind of way. after seeing the movie locke, starring tom hardy, which takes place entirely in a car during a single ride, i realize that just about anything can be pulled off if handled correctly. 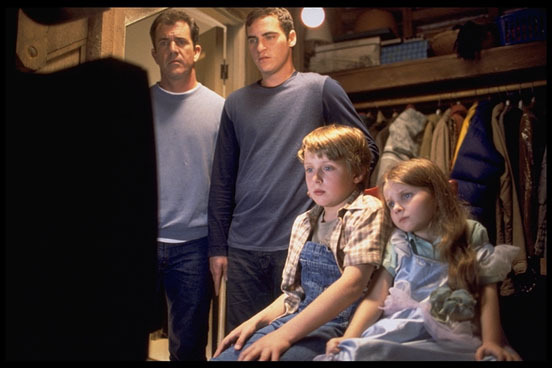 in Signs, for example, the best scenes come towards the end, when the family boards up the house and prepares for their final night. these are the moments that feel like they are happening in real time, without any cutaways to other locations or characters anywhere else. the family members have a supper where everyone gets exactly what they want for their last meal, and then they all climb down to the basement to hide. the scene in the basement is long and exciting. this is where we stay with the characters in one room as they experience the threat pushing in all around them. if only the rest of the movie had been made with this same kind of approach. the first half of the movie is more comedy than it is thrills, with both gibson and phoenix really trying to get laughs through the dialogue. luckily most of it works. even when it is corny, like gibson running around the house screaming things that don’t sound right, the humor level is intentionally awkward. they know what they’re doing here and are in complete control. Signs is a pretty good movie overall, despite a number of flaws. it’s definitely something different and a cool way of telling a story, and aside from that, the movie deserves a lot of credit for the way it jumps right into things, not giving us any backstory or setup before the big events start. but then there’s also plenty about it that just doesn’t feel right. all of the fate stuff is too serious, and almost out of place. between the humor and the alien suspense, we don’t really need spirituality and preaching as well. there’s a monologue about two kinds of people, those who see events as lucky and those who see them as fate. it’s such an elementary conversation that it feels like it doesn’t belong here. the scares work, like a leg that pops out of the a corn field at night, or fingers that appear under a door right before they are sliced off, but still, there are problems. the climax is misdirected to the point where they kind of give us two climaxes with neither one being as complete as it should have been. two halves don’t make a whole here. the basement scene is over too quickly and the morning after scene feels like the scares are all gone and whatever is left is hardly a threat. despite it’s flaws, Signs is still a pretty cool movie with some very creative ideas.